Cheap Royal Caribbean Cruises - Bahamas, Bermuda and Caribbean! Royal Caribbean International are the foremost experts in cruising the Caribbean, and it stands to reason as Caribbean is their middle name! Royal Caribbean also offers cruises to all other regions of the world, including the beautiful island of Bermuda and the lovely island chain we know as the Bahamas. Cheap Royal Caribbean cruises can be found for all three of these destinations, through a travel agent or when you book online. Royal Caribbean departs from numerous ports around the United States, with several ports offering Florida cruises to the Bahamas. For cheap Royal Caribbean cruises to the Bahamas from Miami, there are sailings regularly from September 21, 2012 to May 24, 2013 with stops in Cococay and Nassau that start at only $199pp. From Port Canaveral in Florida, there are sailings from September 10, 2012 to December 31, 2012 from just $229pp. Cheap Bermuda cruises offered by Royal Caribbean include the 7-day outing from Bayonne on April 7th, 2013. From just $499pp, this deal also includes free prepaid gratuities, and takes you to the lovely pink sand beaches, water sports, golf and shopping opportunities that can only be had in beautiful Bermuda. The Caribbean offers cruisers such diversity in the ports of call, and has varied itineraries depending on which area you are interested in exploring. Cheap Royal Caribbean cruises to the western Caribbean, for example offer stops in Cozumel, Cayman Islands and Falmouth in a 7-day cruise from Royal Caribbean from Galveston. This roundtrip from Texas starts at just $559pp and also offers complimentary dining, a $50 on board credit and free prepaid gratuities. Sailing dates for this cruise can be had from fall, 2012 to the spring of 2013. On Royal Caribbean from Tampa, you can explore Key West and Cozumel on their 5 day Caribbean cruise. From only $409pp, and sailing dates from December to March, this is a great getaway for the entire family. 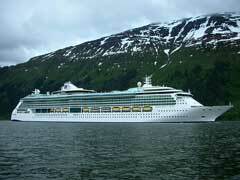 Royal Caribbean deals also include up to a $100 on board credit and other perks for booking early. Exploring the Caribbean, the Bahamas or Bermuda makes for a great vacation destination, especially when getting there will be half the fun on a glorious cruise ship. Getting there with cheap Royal Caribbean cruises will make it all the more exciting, as you head to your ultimate destination in the sun, sand and surf.